This is a pan full of baby artichokes. Did you know that they sell regular artichokes and baby artichokes? When the Brooklyn Italian Grandmother is in the house, she likes a dish that can start as an appetizer and then be carried to the table and continue as a side dish. That’s why she likes fried baby artichokes. The trick with this recipe is to get the smallest baby artichokes you can find. The smallest usually are about the size of a golf ball or a little bigger. 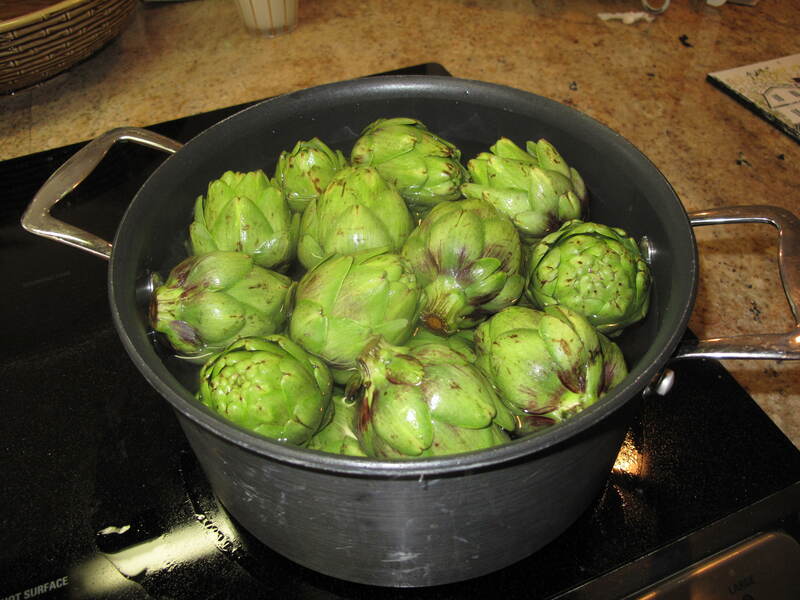 If the baby artichokes are any larger than that, they will require a par boil to make them tender before frying. 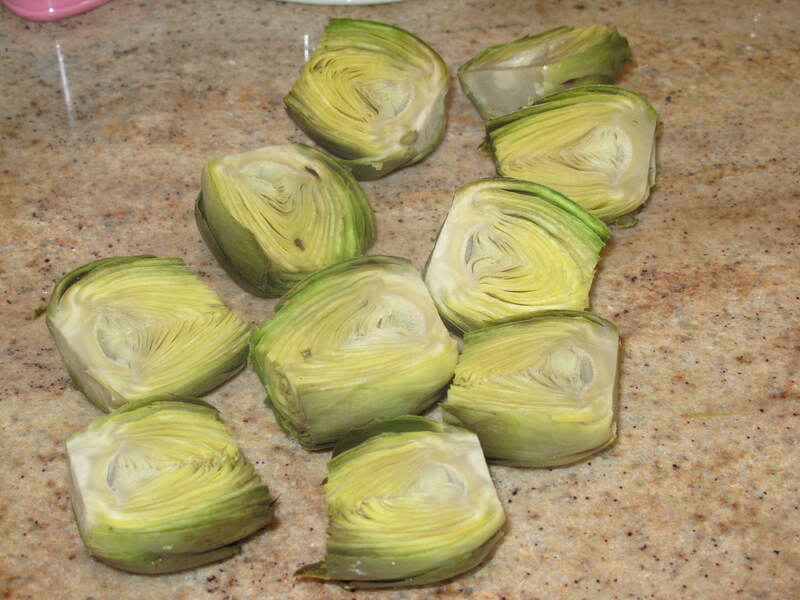 Our baby artichokes looked big so we actually par boiled them in water for about 20 minutes before starting the recipe. Once they had cooled, we took a very sharp knife and cut off the top and cut the stem off the bottom so that it could sit on its bottom without tipping over. After that, we cut them right down the middle into two pieces. For the breading, we used a mixture similar to what we made for the stuffing in our cubanelle stuffed pepper recipe. So sit back and let’s start frying some baby artichokes with the Brooklyn Italian Grandmother. 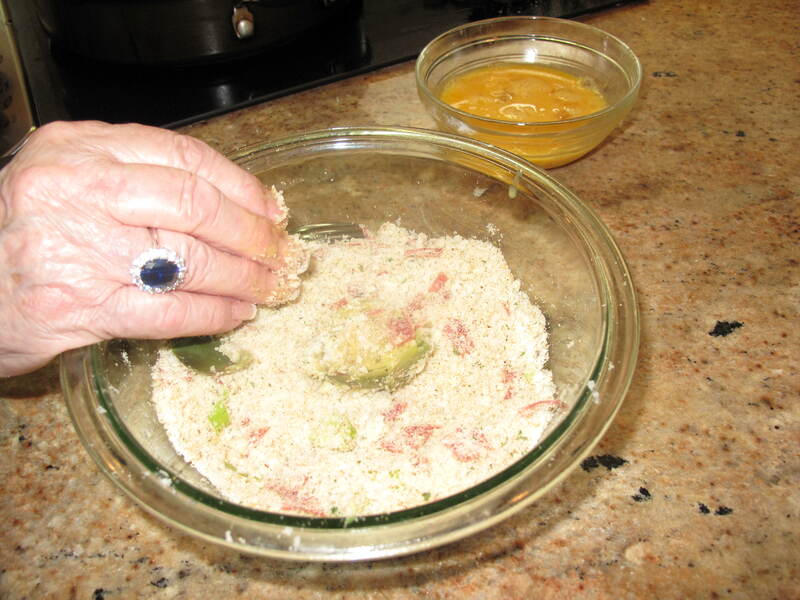 Mix garlic, bread crumbs, cheese, sopressata, salt and pepper in a bowl and combine well. Break eggs into a separate bowl and mix with a fork. Heat olive oil over medium heat until hot. 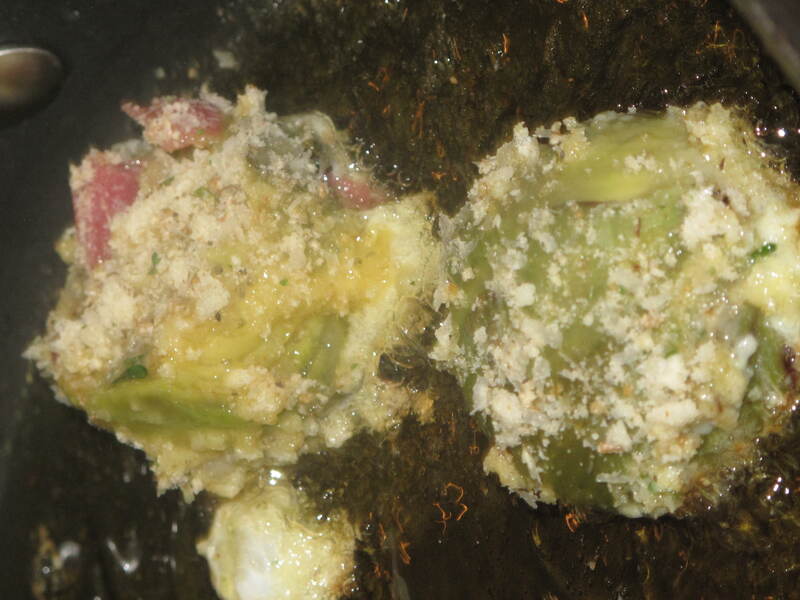 Coat artichoke halves in egg mixture and then in bread crumb mixture. 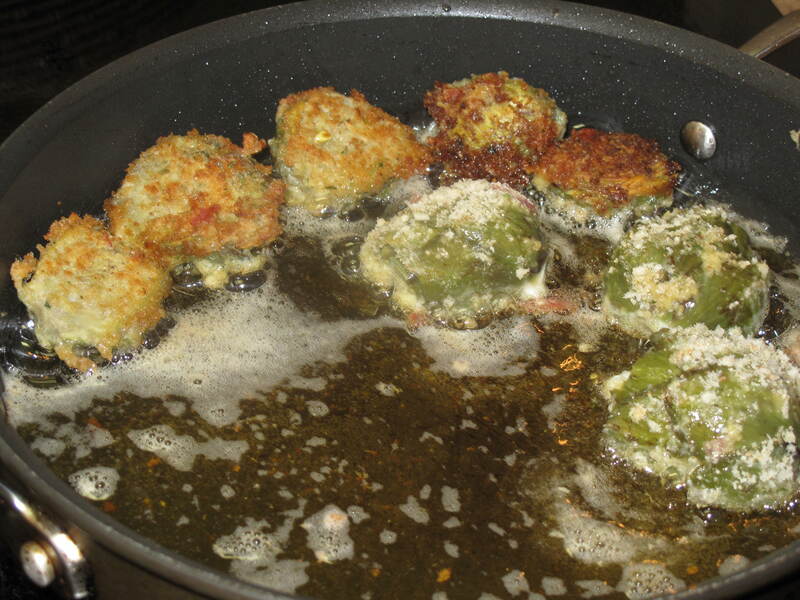 Place into heated olive oil and fry until breading is brown and artichoke is tender. Continue to add more olive oil as needed. When all of the artichokes are fried, sprinkle with more salt, pepper and cheese and serve warm. The good thing about these artichokes is that, because they are small, there are less leaves to eat through until you get to the heart of the artichoke. There is very little waste because the leaves are so small you can eat the entire thing. Start with these as your appetizer and then move them in to munch along with your main course. 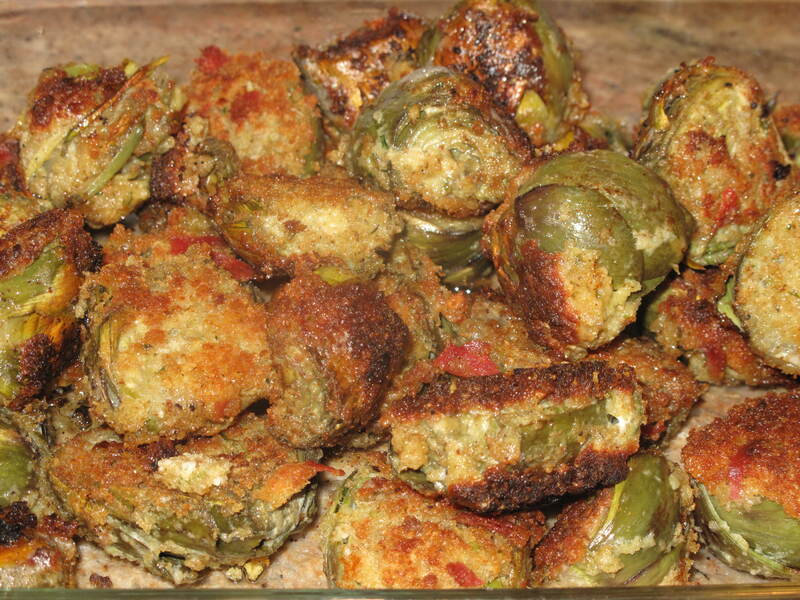 Just like the famous brand of chip…..you can’t eat just one of these fried baby artichokes. Give them a try. What are you cooking today in your kitchen? This entry was posted in Food and tagged Acorns, Blog, Cooking, Family, Food, Fun, Life, Love, My Life, Photos, Recipes, Spring. Bookmark the permalink. Hmm, do you think Brooklyn.I.G. needs another grandson? I love this recipe. I love everything she makes! She’s so liberal with the sopressata. Hi Rufus’. She likes to feed the masses. If you like sopressata, she’s got the recipes. I’ll tell her you are up for adoption. Talk to you later. I am a huge fan of fried artichokes. They are indeed a fantastic way to start a meal though a lot of times they don’t even make it out of the kitchen. Hi joshuafagans. Welcome to Acorns On Glen. You’re right…the artichokes get eaten pretty quickly. They are addictive. Come back and visit us soon. Hi Dianna. Yes, very tasty….and all gone within one meal.